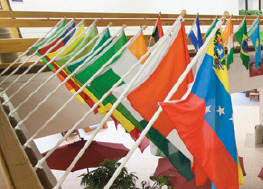 There are many international students studying at OCCC in any given semester and more enrolling each year. This population is important in creating a culture of diversity on campus. But, something I’ve come to understand as an international student myself, is that students so far from their own homes still sometimes hold themselves back. Being mainly surrounded by American students to whom the intricacies of the English language and the style of education is already second nature can discourage international students from learning their new country’s culture. This can cause international students to feel isolated on campus. At OCCC however, there are places and organizations dedicated to helping those out-of-country students feel more connected to the campus community. These are things that offer a chance to learn more about American culture, socialize among those who share a similar experience and even to practice their English. Communications Lab Assistant Tonja Nelson, who runs the English as a Second Language Conversation Group, said it’s a place for international students to improve their understanding of American culture by practicing the language. The group includes English speakers and non-English speakers. She said this semester the group includes students from Vietnam, Korea, Iran and El Salvador. To participate in the ESL Conversation Group, OCCC students can attend any of the meetings held at 2 p.m. every Monday, in the Communications Lab, room 1N7, and at 12:30 p.m. in the Visual Performing Arts Center, room 146. For more information, contact Nelson at tnelson@occc.edu or at 405 682 1611 ext. 7150. World Languages and Cultures Center Coordinator, Chiaki Troutman said the lab was established in 2008 with the specific intention of assisting OCCC’s international student body but it has succeeded because of its welcoming atmoshpere. “International students have many choices on campus where they can come and study such as the communication lab, the library, or in classes. However, many of them choose to come to the (WLCC) lab because they feel more comfortable with the assistance here,” Troutman said. She said international students usually first visit her lab because some English professors require it. After they’ve finished with their English classes, most of the students return and visit the lab regularly. She said foreign students come because they can meet friends who come from their country, even if they are studying in different classes. “In class, they do not have too many chances to talk, so after class, they come here to relax, chit chat and talk with each other,” Troutman said. Students from Vietnam, the Middle East, China, South Korea, Indonesia and Africa and other countries frequent the lab. The WLCC is located on the second floor of the Main Building. The WLCC is open from 9 a.m. to 5:30 p.m., Monday to Wednesday, from 9 a.m. to 7 p.m., on Thursday, and from 9 a.m. to 1 p.m. on Saturday. For more information, contact Troutman at ctroutman@occc.edu or at 405 682-1611 ext. 7104. Azara Baraze, the president of the International Student Association said her student organization offers a unique social experience for students abroad. “You don’t want a college experience which is just all about coming to school, going to classes.You want to do outside activities. You want to get to know Oklahoma, to go outside to meet people, you want to have friends,” Baraze said. She said the club’s purpose is to gather international students on campus and let them get to know each other and share their thoughts on culture with one another. “This club gave us an opportunity to make friends,” Baraze said. The ISA provides both on and off-campus activities. Student Life Assistant Director Kendra Fringer said the ISA’s off campus activities vary each semester. “They’ve gone to events in Tulsa before in order to join some festivals and some different cultural activities. I know that they’ve done that here in Oklahoma City as well,” she said. Baraze said ISA’s members originate from many different countries including South Korea, China, Vietnam, Iran, Morocco, Cameroon and Nigeria. Students interested in joining ISA can apply online through Student Life page at OCCC’s website. From there, students can simply click “Join a Club” and look for ISA. There are no charges for registration, and food and drinks are served during each meeting. The International Students Association meets this semester from 12:30 p.m. to 1:20 p.m., on April 7, April 21 and May 5 at Visual and Performing Arts Center, room 122.